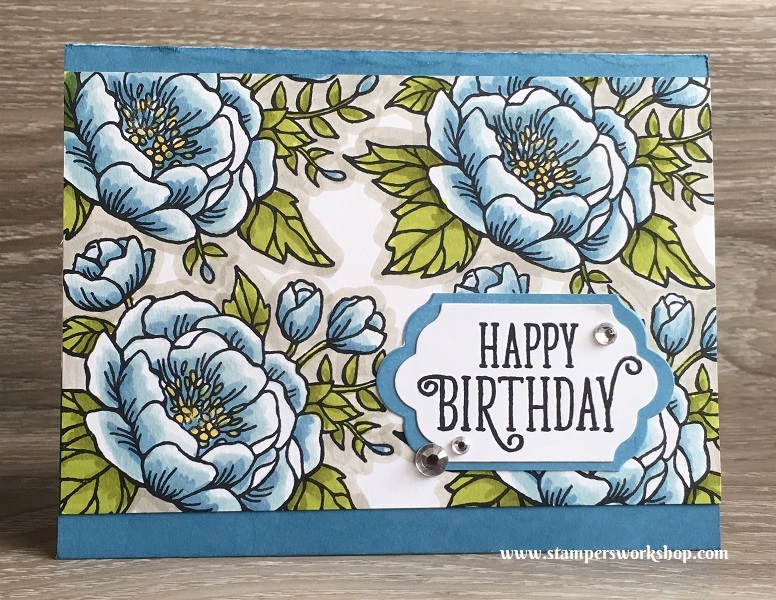 The Birthday Blooms stamp set is, as you can see from my recent posts, a definite favourite of mine. Today I have five cards to share as well as a process video. 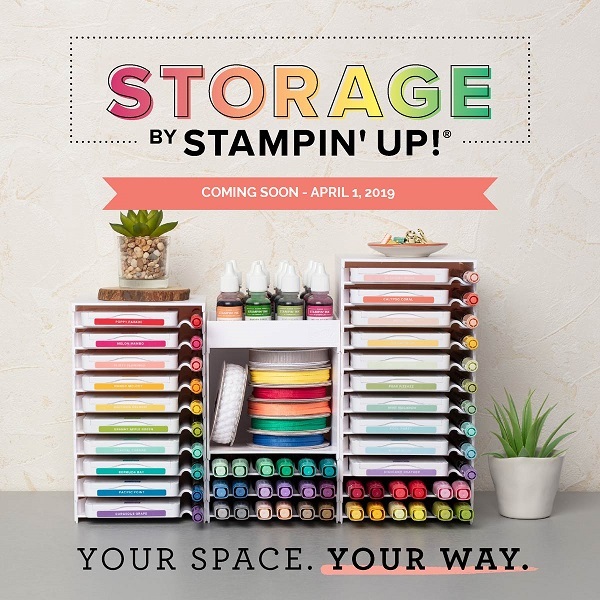 This time I have used the Stampin’ Write markers to colour the images. 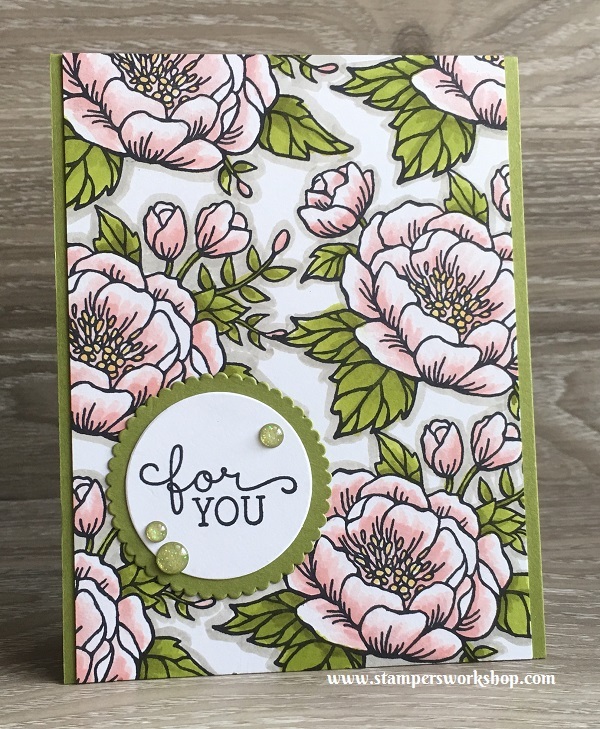 My motivation in sharing these cards is to show how you can achieve a different look just by changing up the colouring medium and the colour. Materials used: Stamps – Birthday Blooms (140658); Cardstock – Thick Whisper White, Whisper White, Old Olive; Inkpad – Basic Black; Dies – Layering Circles Framelits; Stampin’ Write Markers – Powder Pink, Blushing Bride, Old Olive, Lemon Lime Twist, Daffodil Delight, and Sahara Sand; Glitter Enamel Dots and Wink of Stella. I also have a few other cards to share where I have used different colours and design orientation. This card is almost the same as the above however I’ve tried to make the flowers a softer pink. I haven’t applied as much of the Blushing Bride marker to the image. For this card, we have moved away from pinks straight to blues. Marina Mist is one of my favourite colours in the Stampin’ Up! range and I’ve been using it a lot recently. I’ve also used the Lots of Labels Framelits dies to make my sentiment stand out. I used two different sizes of the labels dies, however, I ran the larger die through the die cut machine twice as I didn’t want it to be as big as it is normally. I then trimmed off any excess. I also used the Marina Mist ink pad to colour my cardstock as I had run out of the Marina Mist cardstock. 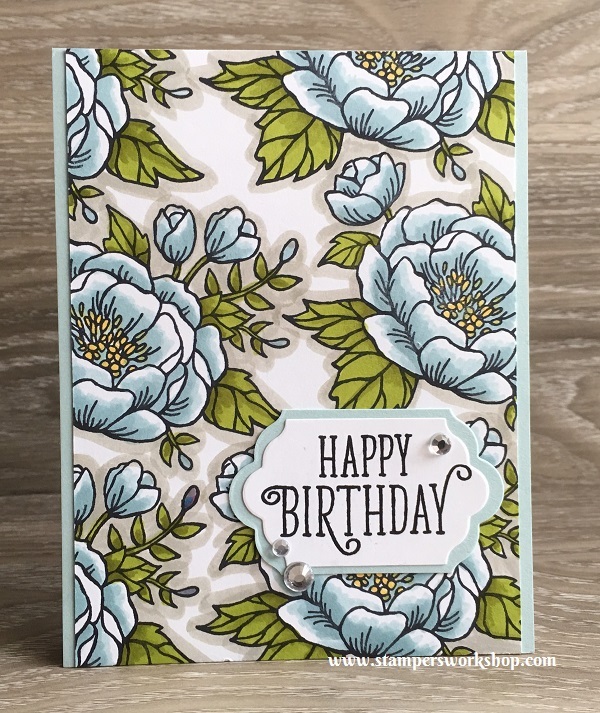 Materials used: Stamps – Birthday Blooms (140658), Happy Birthday Gorgeous (143662); Cardstock – Thick Whisper White, Whisper White; Inkpad – Basic Black, Marina Mist; Dies – Lots of Labels Framelits; Stampin’ Write Markers – Soft Sky, Marina Mist, Old Olive, Lemon Lime Twist, Daffodil Delight, and Sahara Sand; Rhinestones and Wink of Stella. For this card, I decided to go for a really soft blue look. I used the Soft Sky Marker to colour the petals. I then added more of this colour to the areas where I needed it to be darker. In some places, I added two or three layers of colour. I also matted the stamped panel on Soft Sky cardstock. 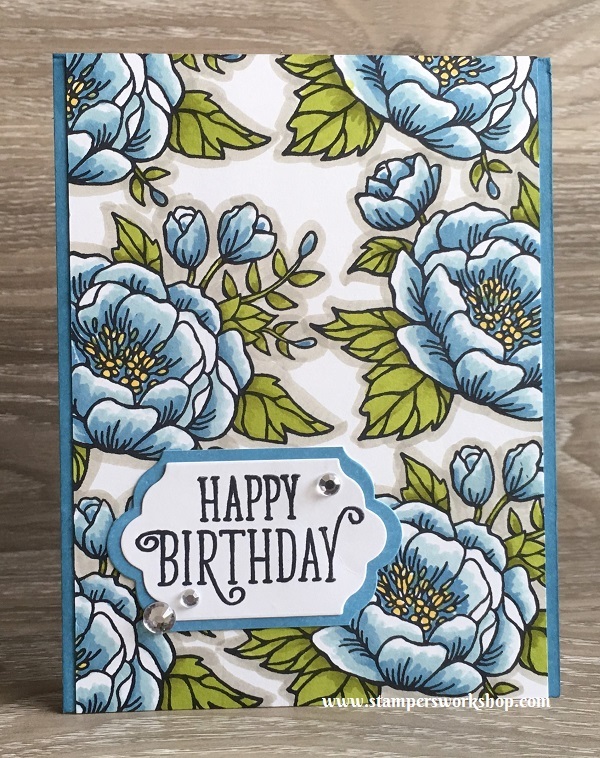 Materials used: Stamps – Birthday Blooms (140658), Happy Birthday Gorgeous (143662); Cardstock – Thick Whisper White, Whisper White, Soft Sky; Inkpad – Basic Black; Dies – Lots of Labels Framelits; Stampin’ Write Markers – Soft Sky, Old Olive, Lemon Lime Twist, Daffodil Delight, and Sahara Sand; Rhinestones and Wink of Stella. For the final card, all I did was change the orientation, so don’t forget that is always an option when you are creating. Thanks for stopping by and viewing my cards and video today. I hope it has been informative. 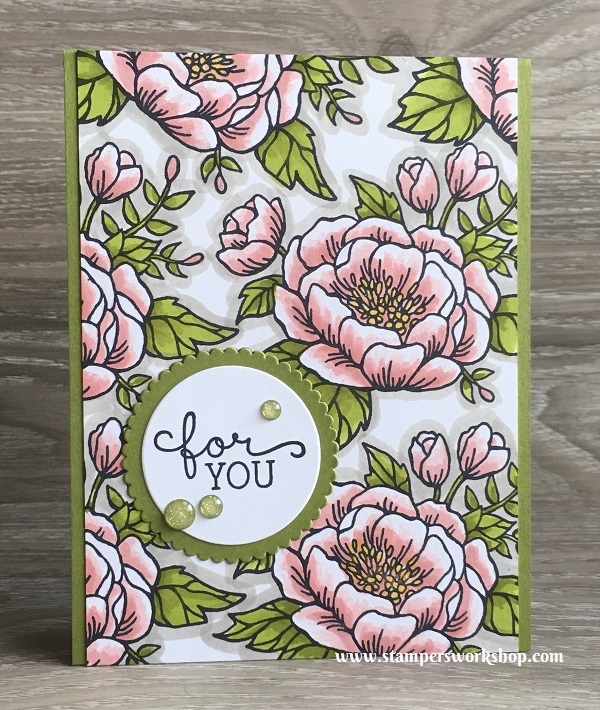 Now it is time for me to give the Birthday Blooms set a bit of a break and give some love to some of my other stamps. Don’t be surprised if it does pop up again soon though as I really do love it! (Don’t forget about the current Bonus Days promotion throughout July as well as the *fantastic* opportunity for new Demonstrators).